"Calera is one of the great and historic wineries in California. They are a producer that epitomizes what Polaner Selections is all about – traditionally made wines (lots of stems and acidity) that have an amazing amount of soul, clarity and balance. And even more incredible: Who else besides Calera is making certified organic, super-traditional wines in an old world style, from 30+ year old estate vines grown in limestone, and has a clone and AVA named for them here in America? No one! Located 90 miles south of San Francisco and about 25 miles inland from the Pacific Ocean, Calera is near Mt. Harlan in San Benito County. 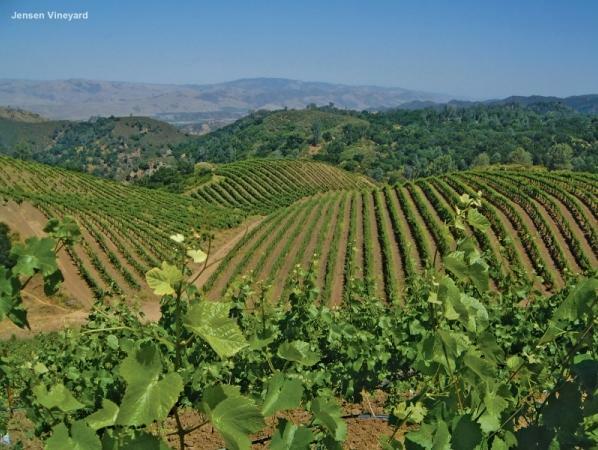 Its elevation is 2,200 feet above sea level, making it one of the highest and coolest vineyard properties in California. All the vineyards are based on selected cuttings from Burgundy ("Calera Selection"), with new vineyards started from massale selections taken from older plots. In the Burgundian tradition, Josh named each parcel individually to emphasize the fact that each would produce a distinct wine. The original plantings are the Selleck Vineyard (5 acres), Reed Vineyard (5 acres), and Jensen Vineyard (14 acres). These vineyards produced their initial tiny crop in 1978. Josh made Calera's first wine in 1975: 1000 cases of zinfandel produced from purchased grapes. During his first two years as a winemaker, he made the Calera wines in a rented space in a larger nearby winery. He gradually purchased more vineyard land, as well as property upon which he built his winery. Over the span of 25 years he transformed a multi-level rock crushing facility into a gravity-flow winery where the wines are moved by the mere force of gravity, rather than by the use of pumps. This multi-layered hillside construction has allowed for the gentlest possible handling of the Calera wines. In 1990 the U.S. government approved the Mt. Harlan AVA (American Viticultural Area), which is high in the Gavilan Mountains (the lowest point is at 1,800 feet above sea level). While it is a large AVA which comprises 7,400 acres, Calera's are the only vineyards in the Mt. Harlan Viticultural Area. Calera's winemaking is steeped in non-interventionist practices, such as the use of native yeasts, hand-harvesting, whole cluster fermentations, minimal racking, and fining and/or filtration only when necessary, insuring the bottled wines express all of the natural greatness of their vineyard origins." Wine Enthusiast 90"A tangy plum aroma meets turned soil on the rustic and rugged nose of this appellation blend by the historic winery, now owned by Duckhorn. The turned earth component shows on the palate as well, with additional flavors of thyme, dried sage, plum and baked sour cherry." Vinous Media 95 "The 2013 Pinot Noir de Villiers Vineyard is intense, pure and brilliant. Dark red cherry, blood orange, lavender, mint, star anise and wild flowers give the de Villiers an exotic edge in this vintage. Plush and deep on the palate, the 2013 is shaping up to be a jewel of a wine.